With the prospect of taking it anywhere, some have held off on purchasing Yooka-Laylee as they wait for it to be released on the Switch. Developer Playtonic Games has now given a little insight into how far along it is, saying that the "final issues" are being worked out. This news comes along a huge console patch that discards many of the games bugs that appeared at launch. The Playtonic team continues to work flat-out on the Nintendo Switch version of Yooka-Laylee. We’re aware of the huge demand for more news on this and appreciate your patience as we work out the final issues. As soon as we’re 100% confident with this version and everything is approved, we will make sure you’re first to know the release date! 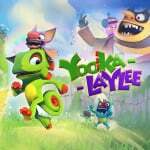 Yooka-Laylee originally released on 11th April for other consoles. No Switch release date has been given apart from a 2017 window for all territories. Are you holding off for Yooka-Laylee on Switch? Let us know. There's no rush. I transferred my purchase from Wii U to Switch. But I'm in no rush to buy the Switch. I'm ready. Hopefully it'll be definitively improved by release. I'd be nice if they fixed some of the glaring issues with the other versions. Maybe then the Switch version will become the definitive way to play. Then again they did release a poorly optimised game with other glaring gameplay issues so I'm not sure how much I trust Playtonic anyway. So I will never play it on my Switch. Good to know. I've lost interest, mostly due to the lukewarm reception, but I'll ultimately pick it up when it releases. I'm just not in any hurry anymore. I played some of it on PC before the update and I just had to stop. I didn't get too far anyway so I'm going to hold off to play it on Switch. I'm glad they're taking the time to do it properly but it would have been better in hindsight to hold off and release it fully polished. Although how would they really know without the feedback of the fans? One thing I'm not a fan of is developing parts of the game as speed runner friendly. It's up to the speed runners to find the fastest way through a game, not the game to work around them. Bought the Xbox One version a few weeks ago when it was on sale and thoroughly enjoying it. Had no issues at all even before the latest update, and I honestly don't see why it was getting bad reviews. I did exactly what the article says. I wont purchase a game like Yooka Laylee for anything other than the switch. Hoping the big console patch is worked into the Switch version though. If thats the case it will be a day one Physical buy for me. @Marshi Is it getting a physical release? 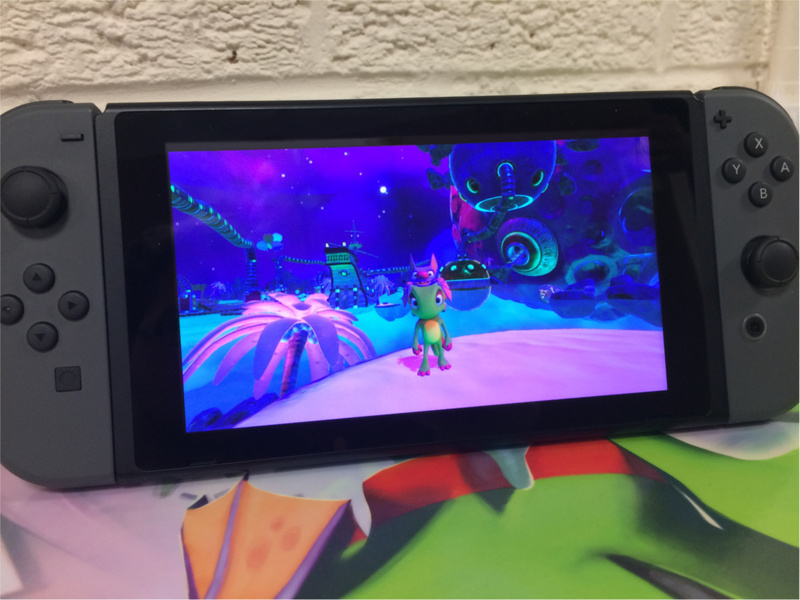 "With the prospect of taking it anywhere, some have held off on purchasing Yooka-Laylee as they wait for it to be released on the Switch"
A bad game is a bad game, whether you play it on a TV or in your hands. @GrailUK Thats...actually a good point. I just assumed it was. It better, because PS4 and Xbox one got one so if Switch doesn't it will be a no buy from me. Too many games coming out to be bothered about one lazy developer. Playtonic has already stated that when the Switch version drops, it will already include all of the patches and improvements of the other versions. I've been putting off buying it on Steam in anticipation of the Switch release. Hopefully not too much longer. I enjoyed this game on PS4. It was alright, but not amazing. It's not something I'd want to buy again on Switch to play anywhere. It's definitely confirmed that it will only be digital for Switch. Backed this day 1 on Kickstarter (originally for Wii U) but getting a bit fed up with the whole circus surrounding the Switch release. Also doesn't help that you can pick up the PS4/XBONE versions for very minimal amounts of money now! Got the backer t-shirt, digital sound track, etc. Months ago, but still waiting to play the game itself. I love the team, I think I'm just starting to get a little impatient myself now. Cant wait. Its too bad this is all around new game inatead of a port be really awesome to ha e a coop mode. There's no rush BUT if it doesn't come out a few weeks before Mario Odyssey they should delay it until a few months after that game is released. @LandOfZeldtir Same here. Got it for $16 at Best Buy (with GCU) as a deal of the day. I was planning on waiting for the Switch release but I couldn't resist playing it anymore and that price just screams, "BUY ME"! I'm loving the game a lot and it confuses me to see some people hate it so much online. There are people that got angry about it and went as far to say it's an objectively bad game. Needless to say, I don't see how those claims are true. As long as you put your expectations in check that this nothing more than a Banjo-Kazooie sequel/successor and that it's not going to redefine the platforming/collect-a-thon genre, then it's a very enjoyable adventure. I'm hoping to beat it this weekend now that I'm finally finished my internship! From what im hearing and reading not too many are happy with the other versions. Im interested but ill wait for a great reveiw and proably a cheeper used copy next year. Totally agree, a lot of tarnished good names gone down in this farce. What farce? Yooka-Laylee is a perfectly fine game. @Boyoshi They already have done, for example there was a large patch for XB1 and PS4 yesterday (PC got the patch earlier). This update came out over 24 hours ago?? And yes I'm waiting for Switch. I back it on Wii U, I want it on Nintendo and I'm waiting for it on the format it is supposed to be on. I have the PS4 version and I would give it a big MEH. As a score. I got bored halfway through. Yeah, looking forward to it. Though given the mixed reviews elsewhere it need to be a physical release. Eh, I guess it's worth giving it a shot when it goes on sale. "Developer Playtonic Games has now given a little insight into how far along it is, saying that the "final issues" are being worked out. This news comes along a huge console patch that discards many of the games bugs that appeared at launch." Not to sound rude but sometimes it helps to read the article you're commenting on. @Marshi They mentioned that the patch would be worked into the Switch version before it gets released, in a prior statement regarding this patch. I'm guessing they want the game to be as good as it can get before they release it (especially after seeing what happened to the other versions). I hope so i loved banjo kazooie 1 and 2 were really badass games i expect that kind of quality really. Glad switch gets the best version they will have at launch. I may not have enjoyed it at launch but after replaying Tooie after years of neglect, I see now where Playtonic was coming from with some of the design choices like learning moves needed to get a Pagie in a later world. Still no fan of leaving a world incomplete but I might just doubledip on it. Does anyone else have the feeling that the Switch version is gonna be cancelled or is that just me being used to games/ports getting cancelled/shelved mid-way development? Yeah, reviews aren't everything, but it does say something when nearly all the reviews gave it a lukewarm reception. It's a shame, it had a lot of potential. They are running out of time before the Mario avalanche hits. I hope it arrives before Super Mario Odyssey...otherwise I probably won't get it right away. I do want to play the game and I'd prefer to play it on Switch, as it's portable and of course the main studio was working on it. It should realistically be the superior version. But I may hold off until it's subject to an eShop sale. I have a backlog of Switch & 3DS games and of course this fall Battlefront 2 launches which will eat up a lot of my time as well. @Vegeta937 Just cause I miss one quote means I didn't read the article? Besides it doesn't detract from my point. If it works well on switch it will become the best way to play thanks to the portability. And the game was horribly optimized when it first released with other issues such as flat and bland levels that haven't been fixed but potentially could be. Still I have my doubts. Also prefacing a rude preconceived statement with "not to be rude" is pointless. I wouldn't say that I'm purposely holding out for the Switch version, I just don't have a PS4 or Xbox One and also my PC is not nearly powerful enough to run it. If multi-plat games are going to keep on releasing many, many months after 'rival' platform releases - even relatively Indie lite titles - this is going to end badly. The Switch version will most definitely be more polished than the other console versions were at launch, as Playtonic seems to dramatically improving aspects of the game with every update. I enjoyed what I played the PC version before most of the updates, so I expect it'll be a lot of fun on the Nintendo Switch. Why is there demand ... ??? It was VERY poorly received!!!!! @Equinox No, they're not "waiting to see if it's successful or not," and I'm unsure where you got that from their statement featured here. I spend couple hours on it on ps4 and biggest issue for this game is camera, creating on easy task problem. After quality of Mario games this is not acceptable on nintendo platform For me. I will buy it only on good sale. @Forde999 I've also been assured that the latest patch will be included with the Switch version at launch. @fluggy Because it's exactly what fans of Banjo and Kazooie want. This game is like a love letter to those that love the Banjo games. They have also updated the game so it's much better then when first launched and reviewed. Switch reviews will probably be better then all the rest. @ban I read all the comments, and I was so excited that no one had responded to him yet. Just let it happen, he isn't wrong. After seeing what the game turned out to be, I don't mind the wait. In all honesty I'm probably going to pass at this point. A good 3D platformer is what I want, and Mario Odyssey very clearly looks like it will be a fantastic one at that. Patience would be easier if they would be more up-front. The creation of this game was possible only because of the backers that gave them money on faith alone; they owe the backers more explanation and transparency. Would strongly prefer buying a physical copy. Mario Odyssey is coming out soon. At this point I want that game. So they dropped a glorified beta back in April and the Switch will get the true v1. Still looking forward to this one a lot. Hope they give us a physical release like they did for the other consoles. Yeah, take all the time you need guys. I'd rather play a well-polished game than a rushjob that just frustrates you due to all kinds of performance issues! I'll buy it when it releases. The Switch is my only console (except for my Wii U I kept for all of the VC/eshop/Wiiware stuff I have on it). So I downloaded it on PC "legally" to test it out. I completed the first world and I like it. I just hope for making us wait so long they add and extra world or something. I'm buying it, still waiting. @jwfurness Nintendo did the same with the Switch back in March. @SLIGEACH_EIRE Haha, touche. I couldn't wait on that one though. It's been a GREAT 4 months. For a split second I read the headline as "Playtonic gives up on Yooka-Laylee for Switch", which is an understandable reaction after cancelling the Wii U version. I'm quite concerned over the way they described progress on the Switch version too. I would expect them to have at least a basic idea of a release date by now and the context of "final issues" sounds more like a contractual or licensing issue, which makes me wonder if they've even started work yet. @BulkSlash Funny you got contractual or licensing issues out of that statement. It sounded more to me like technical issues. But who knows? @BulkSlash The issue is that the API for Unity on Switch is not the greatest which is causing a lot of issues porting. They need to try and release this before Mario oddessy because when Mario drops nobody will care. @Equinox This isn't drama. It's just an update for interested parties. You're really making something out of nothing. Is this an opportunity for fake internet outrage or am I interpreting this wrong? Almost a certainty that once it's considered "done", and a release date is set, it'll still be after an arbitrary waiting period of a couple months. @Donutsavant I don't even know what that means. @CorvoRevo I'd argue even games with great reviews can be mediocre. Hard to know if you like agame one someone elses experience. After mostly critical reviews slamming the game, I could care less. Won't buy it anyway. Just cancel it, after the horrible reviews the game got on the other systems, and the fact that Mario is coming out soon...just don't release it. Trust me it won't sell well. @Equinox doubtful. We already have that answer. The Switch is highly successful. This is a dev house that loves Nintendo more than anything else and want to get it right. Now that the latest patch supposedly fixes many known issues I think I'll pick this up for my PS4. It should be cheap now and if it really is rubbish I can sell it on/trade it in. Especially if the Switch version is going to be digital only. At first, it sucked this version was coming later but, given all the bugs and patches and fixes going on I'm kind of glad I held off. By the time it releases on Switch, it should be a much more polished game. Not buying into this junky game. The delay is ridiculous and the price should be launched at a budget price at this point. There is plenty of platformers on the switch i dont mind waiting if this will cause a less buggy game. Just make sure you release before mario comes out please! I get so baffled by the amount of hate this game gets. People get excited for this game because it promises to be a BK clone, then get mad because it is a BK clone. Does anyone else see the irony in this. At the very least, I expect it be better than BK: Nuts and Bolts. ..lol..better late than never...I totally read the title wrong..
Nah for those who have a PS4 don't waste your money on it, even if it's cheap now. And yes I have a PS4...trust me the game stinks, just avoid it. There is no way this comes out before Mario...it will come out after it...which equals dead in the water. Were they 100% confident with it when they released it on other platforms? @Equinox what do you mean? This isn't a school yard bully. They aren't out to get anyone. They are a business, doing things that businesses do, they will release the game when it's ready on a system that they know has a lot of interest in playing their game. Am I holding off on it on Switch? Well, yes and no and maybe. What do I mean by that? This: that I'm not 100% certain yet whether I'm going to buy the game in the first place. HOWEVER, should I buy the game, it'll DEFINITELY be on Switch. So news on its release is still something aim looking forward to receiving. Bring it on! Playtonic could potentially turn things around for this game. There is a possibility the Switch version could be the better version. @SLIGEACH_EIRE do you just post in the Switch threads reminding everyone you don't have one and how you hate ports? I think we get the point. @Equinox Considering how poorly the PS4 port of the game runs, I'm inclined to believe that they honestly couldn't get it running on Wii U and that they weren't nefariously trying to trick Wii U owners. Honestly, if them moving it from Wii U to Switch means that they themselves will work on the port rather than the team that handled the PS4/Xbox One ports, I think it's worth it. No, I'm not waiting for the Switch version. I'm waiting on the Wii U version. I'll apparently be waiting long after I'm dead. @Boyoshi Well, first off, let me apologize for assuming you didn't read the article. Considering the information that I quoted to you is in the last two sentences of the opening paragraph which is literally only three sentences long, in an article that takes less than 30 seconds to fully read, I'm sure you can appreciate why I would jump to that conclusion. Secondly, I completely agree that the switch version of Yooka-Laylee will be the best of all the others if it's ported well and everything ironed out given the recently released patch fixes most, if not all of the games bug problems, etc. - as I truly think any version of pretty much any game would be better on the switch for the same reason - portability and versatility. But to be honest, I feel like you're kind of strawmanning me on that one because I never said anything against your statement of the switch version to begin with. Also, I understand your gripe with the original release of the game and all of its problems, but to be quite fair, you didn't say anything about level design in your original post. Lastly, I completely get your point about the "not to be rude" comment and I hate that the internet takes away the natural human ability to convey inflection in our speech, because if you really knew me and heard me say it the way it was meant to be conveyed, you would have known I seriously meant I was not being rude in any way, shape, form, or fashion. Regardless, I understand you took it offensively and I also apologize for that as well. @Vegeta937 I figured this was all was a bit of a mix up. No hard feelings. The thing is (and this assumes people only own a Switch) this version has a chance at redemption. Now, I am not expecting the Switch to get some kind of exclusive version, but I do expect most of the criticism to be addressed day one from our perspective. As such, whereas all the other formats may have 'missed the boat' so to speak, the Switch version has a chance to shine to a new audience. I also don't think Mario is going to choke it, as there is a decent market for 3D platformers on Ninty consoles. If the negative points of the versions already released will be addressed, then I'll consider buying it on the Switch. I played to PC version over at a friends house. It was fun but I found the camera angles finicky. And the talking noises are annoying to me... I wouldn't mind an option to turn those off completely. I'm quite excited for this game. Sure, initially it got mediocre reviews, but Playtonic has updated the game and made it more polished. It seems they're also making sure that Switch version is working well. I'll definitely get it. I don't mind the wait if the game turns out great. But that's the thing, @gatorboi352, Yooka-Laylee isn't a bad game. Well, not any more at least! While it can't be argued that the original build didn't ship with a variety of issues and questionable design choices, they've pretty much addressed all of them with the latest update. PC owners got the latest build, then it was rolled out to PS4 and Xbox One this past week. The good news for Switch owners is that Playtonic have since confirmed that the game will launch on the eShop with the very latest update already in place! So it's all good, right guys? @Dr_Corndog It better cost the same as the other versions too. For me it's taken too long now I've lost interest in it there are way too many titles coming out that are higher on my want list and I'm sure , very sure that Super Mario Oddessy will fill my 3D platformer itch but I hope the title does good on Switch. I speak for most Nintendo fans when I say that we don't want this mediocre SJW game on the Switch. I really don't understand all this "better release before Mario Odyssey" talk. As if we're limited to only one 3D platformer per console generation? "Whelp, I finished Odyssey, looks like I'm done with 3D platformers for the next four or five years. Sorry Yooka-Laylee." @BLAZINOAH - Oh man, you somehow had the worst comment in an avalanche of terrible comments in that Jon Tron thread. I'll never forget your pretty face. Crawl back into the ooze. I find it unbelievably irritating when people like this @blazinoah character make these bizarre and quite frankly irresponsible "I speak for..." comments. I'm sorry, @blazinoah, but you certainly do not speak for this Nintendo fan. Did someone here seriously say SJW? Edit: Oh No...Cultural Marxists. Of course he said it. @Equinox Is there a reason to wait and see with Switch at this point? At this point in its life, Wii U was around half the sales of Switch. Am I the only one who looked at the headline and thought it said Playtonic Gives Up on Yooka-Laylee? I have hope it will be good on the Switch. Given how it's portable, that can only be a good thing. You speak for yourself and yourself alone. And not particularly well. @Equinox The only excuse most devs have is they lacked a dev kit soon enough to start making games in year one. And with how poorly Wii U sold, I don't think most of them would've had confidence in the Switch at launch. I'd argue that the time when they shouldn't have confidence has passed, but I'm still not expecting anything to really get going until year 2. I'm not too bothered about Yooka-Laylee after reading several reviews. But don't you know, the Sausage Jelly Waffles forced innocent Jantran out of the game and that is a violation of his free speech. Never give them an inch. Where's Donald Trump when you need him (probably playing golf TBH) to stamp out this evil conspiracy? Bloody Marxist Muslamics (I'm paraphrasing one posters comments history here mods!). @electrolite77 @DiscoDriver44 - I think I speak for most Nintendo fans, or probably just my own overly angry self, when I say well done. Very well done. Thank you! @SLIGEACH_EIRE Genuine question, what games would you want to be on the Switch before buying? Or do you not like what the console offers in general, no matter the games? As a PC player, the patch really improved this one. Was disappointed by the lack of Wii-U support, but given how much this game pushes my PC, it's a miracle they're working to get it running on Switch at all. Dropping Wii-U support was probably the right move for the game, otherwise we'd still be waiting for them to release a severely paired-down port. @flightsaber Yeah, even the Xbone and PS4 struggle with it. Imagine the Wii U, or even Switch! Too late just like Rime, no one will buy it at full price especially with Super Mario Odyssey coming out. @Ballzilla He wants to complain. He does this on nearly every piece of news. At this point it's trolling at its most dedicated. Which part would you like to be start on, the fact is was paid to be produced on Wii U, numerous excuses regarding delays, had to patch the game what they did release, etc. etc.. They still have peoples money and have produced what is reviewed and my experience of playing at a gameshow (admittedly prior to release) and somewhat average game. And yes a lot of games suffer with similar problems and use the same BS excuses for it. But these people worked at rare and there amazing at making games! not in my mind. I don't really know why you are questioning my view as I am not alone and it is well documented of the problems. But I'm glad you have enjoyed it. @Vegeta937 Not sure exactly what you mean. It is just another excuse for not giving people what they have already paid them for. What have I missed? Wii U didn't have enough horse power to handle this game. They just couldn't make it work on that aging hardware. Also, the Wii U is pretty much dead now that the Switch is out. Those are two very good reasons for the move to the Switch in my book. Also, update patches is the new industry standard nowadays. Everyone does it (for better or for worse). Regarding reviews, they were all over the spectrum for sure (glowing reviews for this game do exist, which means it certainly resonated with a number of people). Finally, as far as I'm concerned, the game is above average. I'm very much happy with how things turned out (I played it on the XBox One). No prob man. I'd like to think of angry gamers like our friend to be a very loud minority. @GeminiSaint thanks for the objective description. Just speaking for me, I didn't back it but meant to buy for Wii U upon release. I can understand why it moved to Switch, but don't feel like they were upfront about it and can't help but wonder why this wasn't executed better. At this point I may be getting a less buggy version but I had to wait for months and will likely be paying full price when it's cheaper elsewhere. Still like the game, still want to play it. Just not convinced I should award Playtonic with full MSRP. Given that games sites and magazines don't often change their review scores after a game receives updates, I can understand them wanting to have the 'definitive version' before they release it on Switch to a fresh batch of reviews. Hi, I'm glad you have enjoyed the game and respect your view of the handling by them. I'm not writing this trying to change your mind, but just wanted to clarify ,y view a bit more. I just felt it to be a very generic platformer with little of nothing new. And also like commented to release the game that struggles to run on PC, really!! Other switch games look gorgeous, run well enough, and some do that with online play. So poor excuse in my mind. And now to my biggest issue with the marketing by playtonic - When the game first was discussed they were very vocal of there love for all things Nintendo, so to be given the game last and so much later is a big insult. 1) The game doesn't struggle on PC. In fact, the PC version of Yooka-Laylee is the only version that can run at 60 fps. Not even the XBox One version can do that! And optimisation is pretty much unavoidable when you want your game to run on less powerful hardware than it was originally built for. Without optimisation, you may end up with something that runs at 15 fps or worse. 2) The biggest factor preventing Yooka-Laylee from coming out on Switch at the same time as the other versions was the fact that Playtonic just didn't have the devkits from Nintendo. There isn't really much they could do about that. If Nintendo doesn't distribute those devkits in a timely fashion for whatever reason, that's going to result in an unavoidable delay, and that would be Nintendo's fault unfortunately. I'll take the correction with point one, but that's not the case on the other two versions. But the second point is based on what? , they never initially intended to put in one the switch and there is no evidence that Nintendo didn't send them a kit. But seriously you seem delusional with regards to this so I best leave you alone with your opinion. But for me playtonic fall into the same category as EA but with nothing credible to their name. After recently beating Super Mario Odyssey, I am craving more 3D platformer. Hopefully this comes to switch, sooner rather than later.